Working on a new series of tapestries where modest crayon drawings are translated into digitally embroidered tapestry. Pleased to be working with former Dolce and Gabbana knitwear designer Genevieve Sweeney on this. 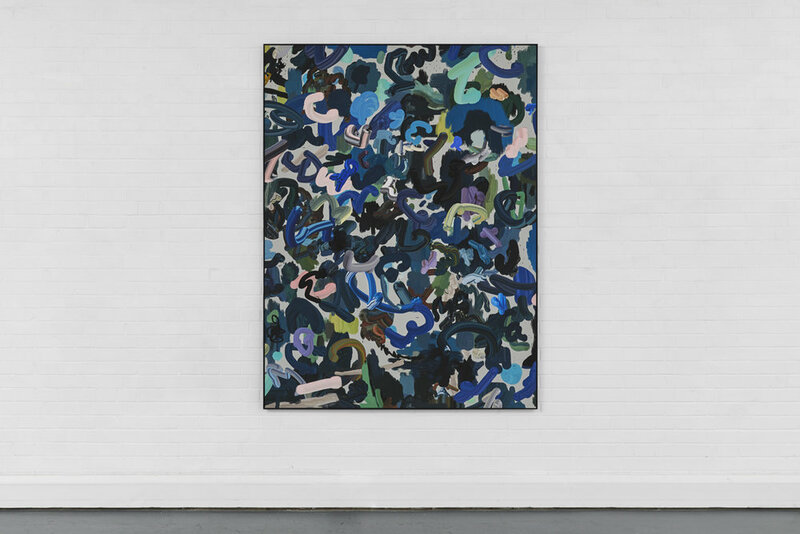 The eye scans, searches and stutters across ‘Natur Blick’, the new group show curated by Augustine Carr and Paula Zambrano at The Koppel Project in London. Before visiting the show I read the short accompanying text by the artist, writer and academic Chantal Faust. The text traces the different sensory and digital guises of scanning and, as my eyes crossed the page from left to right, simulating the rhythmic and repetitive action of both human and machine, I became hyper aware of the ease with which we scan images, ideas and information. 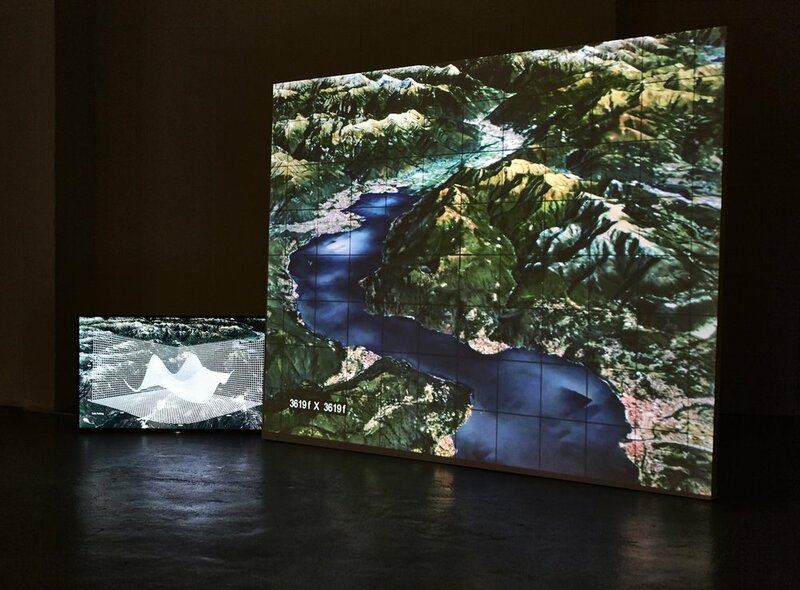 In ‘Natur Blick’, scanning - the instinctive visual movement of the human eye, a gesture co-opted by modern technology - is the subject of the work of ten contemporary artists: Augustine Carr, Chantal Faust, Otto Ford, Gili Lavy, Clair Le Couteur, Samantha Lee, Alix Marie, Anna Skladmann, WARD and Andrea Zucchini. Their work each explores scanning as a multi-faceted operation: as a creative method, a mode of representation, research and rehearsal and as an encounter with contemporary art. 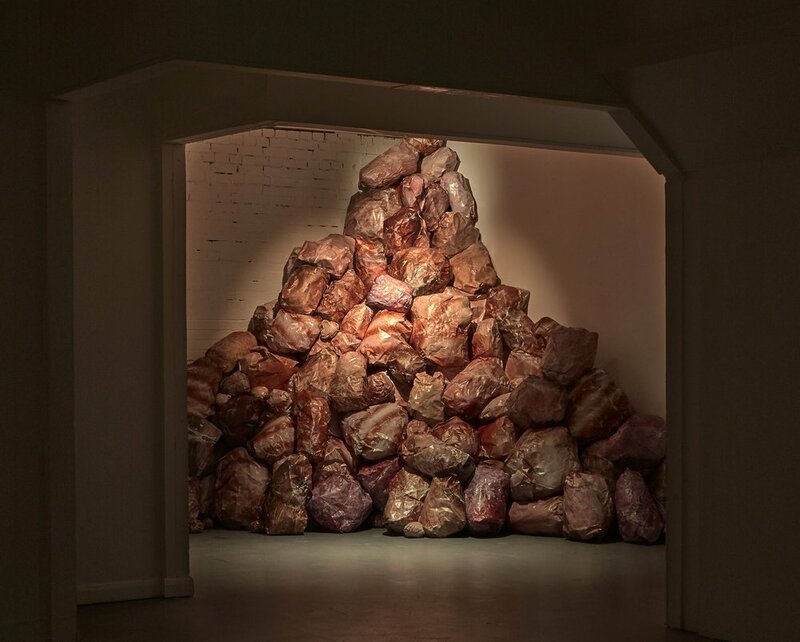 This specific exhibition encounter is one of many different surfaces, sizes and synchronicities and is presented across the two floors of the gallery space. From photography to installation and video to sculpture, the show is an intriguing balance of analogue and digital, two-dimensional and three-dimensional. Positioned in the centre of the ground floor are two 3D rendered sculptures by Carr titled ‘Summa Theologica’ (2018) and ‘Glanz’ (2017). 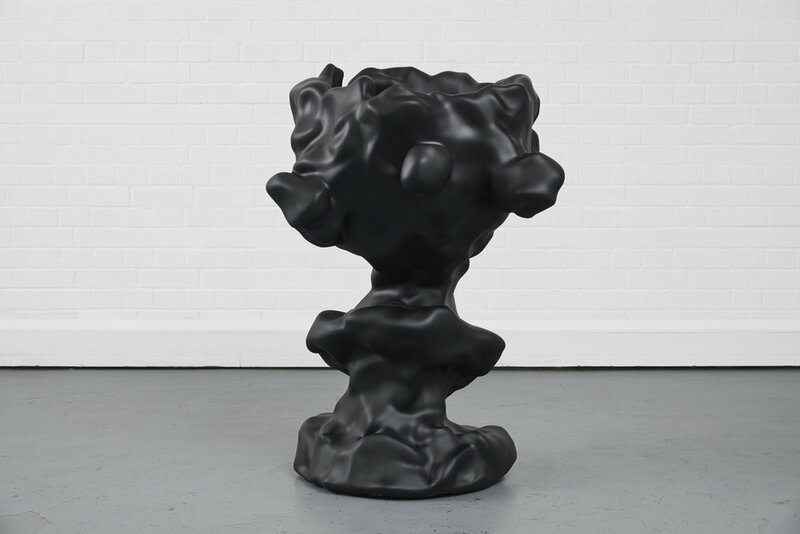 Carr’s sludgy sculptural forms offset the precise nature of the scanning technology used to create them, it is here that the digital emerges as something fluid and perceptive. Hung on the opposite side of the room is another work by Carr, ‘Preferred By Teachers’ (2018). 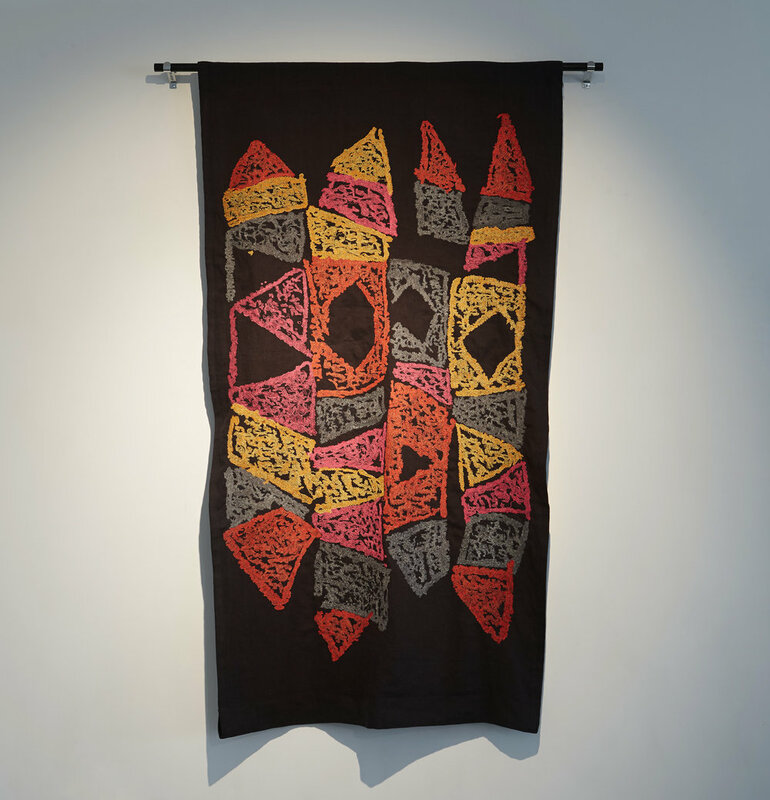 The two metre digitally designed hanging fabric puts a modern spin on on the ancient tapestry. Also presented on the ground floor is Otto Ford’s ‘Pablo in Pieces’ (2018) which preserves the movement and expression of a paintbrush through effect and rendering. 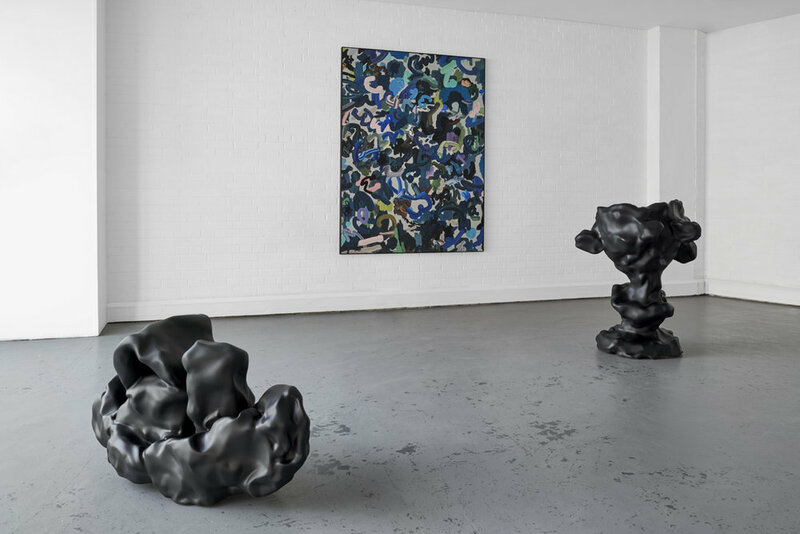 By employing digital mediums that scan, print and imitate, both Carr and Ford remodel the traditional mediums of painting and sculpture whilst challenging contemporary digital aesthetics. Tucked downstairs in a room of its own is Alix Marie’s ‘Orlando’ (2014), a large-scale photographic installation composed of prints of close-up body parts which have been dipped in wax, crinkled, scanned and reprinted. Marie’s process results in a melting and crackling effect where human flesh becomes blurred and ungendered. The title, which references Orlando, a character that turns from male to female in Virginia Woolf’s novel of the same name, works to reaffirm Marie’s blurring of binaries, a blurring which is symptomatic of scanning, where blindness and awareness occur simultaneously. The title of the show loosely translates as the ‘nature of looking’ and is derived from a quote by the German writer Johann Wolfgang von Goethe, “Thinking is more interesting than knowing, but less interesting than looking.” Much of the work in ‘Natur Blick’ speaks to Goethe’s proposition, its appeal is found in its aesthetic qualities and visually exposed artistic processes - scanned, printed, recorded - each work reveals its own traces and perceptions. These traces and interpretations are most engaging in the three-dimensional work where depth is explored and the immaterial is made material. The abundance of two-dimensional prints feels too flat, too familiar and too easy to scan. 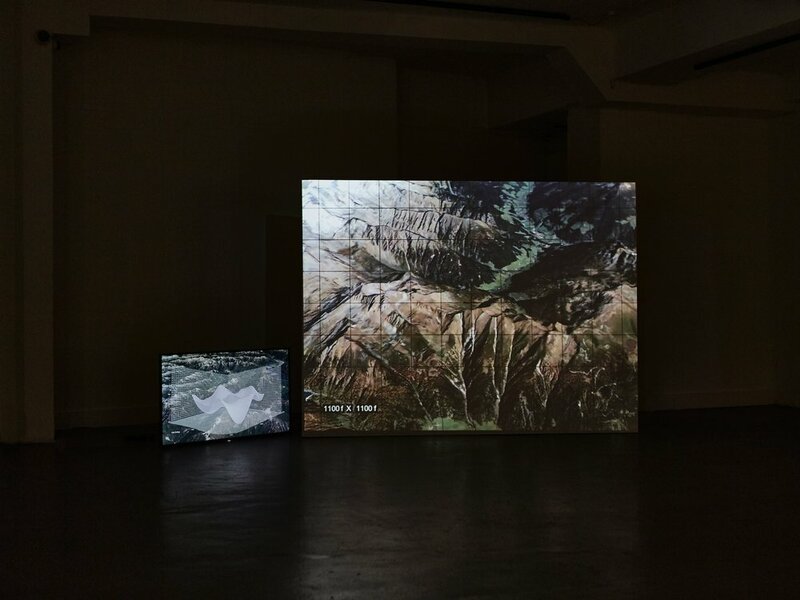 In today’s flattened and scannable landscape, where surface and process is squashed to screen, the allure is in the sculptural works that glare back, causing an optical stutter. Assisting Alix Marie in remaking my favourite work of hers - Orlando for Natur Blick this week. So grateful for CJ Everard to suggesting Alix to me for our Natur Blick show. Alix Marie, Orlando, Photographic Instalation, Various Dimensions. "I think I scan, I think I scan, I think I scan. And I touch, in order to see. Scanning is a visual movement, a sweeping glance, a skim, an analysis, and a conversion. To scan is to look quickly, and also to look carefully. In the digital realm, scanning demands proximity, it is intimate in this way. The seeing eye of the machine is a reader of surfaces, recording traces of a perceptual and tactile encounter. In the land of the flatbed, touch, vision and memory become inseparable. In this sense, the seeing organ is more akin to a tongue than an eye, a close-up form of perception and ingestion, licking blindly in the dark." Really pleased to have Clair Le Couteur RCA PHD opening and closing Natur Blick, a show I am curating a the Koppel Project around the idea of scanning. Where to scan might be 'where the digital meets nature' or 'to look at something with real intention'. Clair will perform with Carli Jefferson as the Lunatraktors. "‘Scan’ first comes into English to describe analysing the rhythm or structure of verse by tapping the foot. Performance research duo LUNATRAKTORS work with an intuitive, collaborative form of scansion, re-awakening lost songs from the folk archive into embodiment. Working with harmonic singing and body percussion, voice and rhythm are used to scan the gallery space, picking out resonant frequencies and ringing tones. This singing practice is combined with LUNATRAKTORS’ wider project of self-transformation through scanning the archive of folk song for moments that resonate with their theoretical, personal and political concerns, scanning the written verse to ‘hear’ the music in it, and re-archiving that material into the body by ear and by heart. ” Here is a clip of Clair performing at the Horse Hospital. I graduated with a Fine Art BA from Central Saint Martins in 2011 and with MA in Painting from the Royal College of Art in 2016. I spent my mid twenties and early thirties editing television programmes and making my own films. My films grew simpler and sparer. I felt compelled to move beyond the captured image. My father came from a Calvinist background, where art was discouraged and seen as decadent. I shared that view for some time and had no real interest in fine art until I started making drawn transcriptions in the National Gallery in my thirties to try and understand what picture making might entail. I enrolled at Central Saint Martins where I had an exciting time as a painter – in the last year of my BA, a van driver failed to indicate and knocked me off my bicycle leaving me with a shattered right elbow and neuralgia in both hands, temporarily unable to hold a brush. But after a while, I found that I could make rudimentary objects in plasticine and clay with my left hand. As a result, my painting practice began to broaden in to sculpture and film. After graduating from St Martins, I began to make assemblages of modelled sculpture and found objects. A conversation with the artist John Stezaker sparked an interest in the possibility of collage for me. John believes that a conceptual practice is a kind of cul-de-sac and that image making is all. I went to the RCA to be taught by one of my favourite painters, Ansel Krut, and he did not disappoint. His picture making is not unlike his company, full of playful wit and generosity. He shared with me his penchant for a full English breakfast before starting a new canvas and I have been getting rounder ever since. Your major piece titled "Glanz" is a large black morphic looking object. Could you tell us about this piece? How was it made? At the RCA I wanted to give the quick, intimate works I made in my left hand currency and move them beyond a domestic scale, so I had work remade by precise machines. Small maquettes were 3D scanned, enlarged in CAD and CNC milled at a greater scale that exaggerated the work’s expediency. 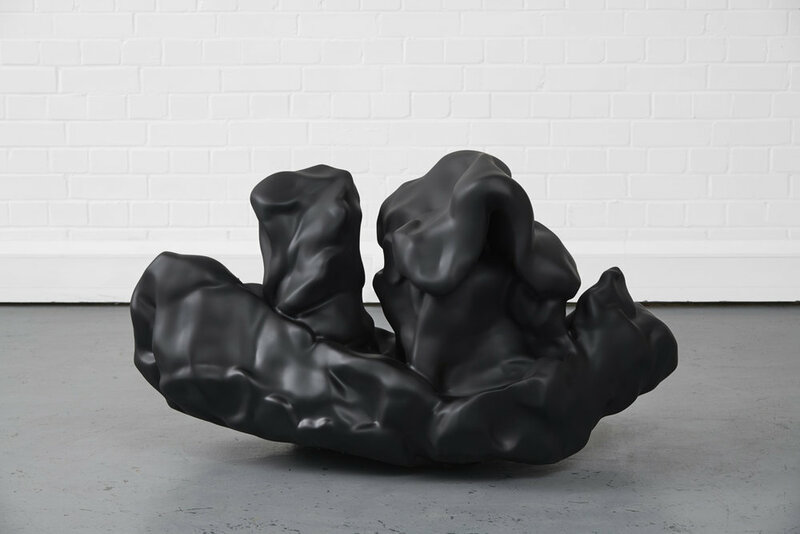 So, Glanz was modelled with one hand in plasticine, in a minute or so, and then digitally enlarged, so the asymmetry is amplified and takes on a life of its own, sitting somewhere between myth and fantasy. The lumpen character of the cup is both brutish and gigantic so I like its title 'Glanz auf der Nase’ (in English ‘glance at the nose’), which came about after an accident in my studio, where the oil of the original plasticine maquette seeped into a Freud text on the fetish. In the northern medieval church, what was seen as the greatest poverty in society was given virtuality in its masonry. Glanz was first shown in the knave of the Asylum Chapel in Peckham for a Frieze event, where its new scale reveals both a sensitivity and a brutalism. It seemed to speak of something overgrown and lumpen, yet innocent and playful. You have an ongoing series of works that depict painted-over books. Could you tell us about these works? They are digital prints, right? Yes. I paint on found books. I see the painting not as an intervention but as a re-writing of the book; painting as embellishment rather than defacement. This practice is directly informed by my research into medieval marginalia, where pictorial additions to a text open up new readings and ideas. While thinking about how to situate and present the work, I became interested in archiving them. To photograph these books, I black out the room and turn a scanner into a camera. 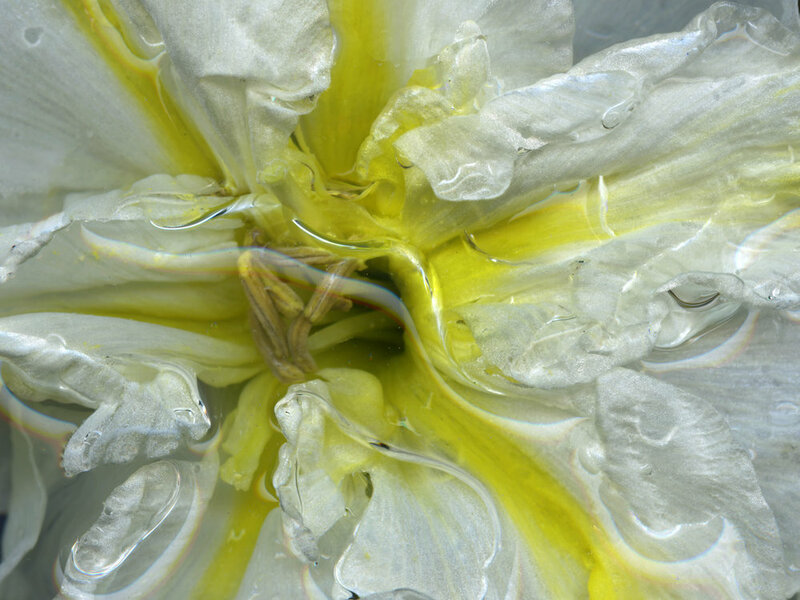 The book is pressed against glass, weighed down with a brick, photographed at a high resolution, enlarged and printed. The immense detail contained within the photograph creates a kind of a paradox – as the print is enlarged, it seems to become more intimate. Yet the book and the painting are not there of course, only their image. Some people have read this work as a tromp l’oeil. These prints were the first photographs ever to have been selected for the RCA painting collection. Some of the more traditional painting staff at the RCA were resistant to discussing the painting within the image at first, but would then find themselves hooked into a conversation by some small detail in the photograph that took them by surprise. It made for interesting crits on the layers within layers in the work. For me, it’s my peers’ work that resonates with me most. Work that is a part of my own dialogue in some way. For example, I walked into the Dot Project in Chelsea on Friday and saw these fantastic ultramarine blue pigmented works which I loved . . . then, on the following Monday the fashion designer Genevieve Sweeney, whom I am working with, told me about her sister covering her grandparents’ house in blue pigment while they were on holiday . . . And sure enough, the works were by Gen’s sister Florence! The London art world is just small enough for us to feel ourselves spinning around conversations with in it, many of these conversations are one way, of course, but not as many as you may think. My children and I were bowled over by Giorgio Griffa’s show at the Camden Arts Centre; his gentle line and chromatic economy left us all singing and humming as we followed his trail of pinned, folded hessian through the galleries. My daughter Rose is named after Rose Wylie who bounced into my studio at the RCA one day in her Air Jordans and dragged the palm of her hand across an expensive print of mine, wiping away the pigment, without realizing it was a photograph of a painting rather than a canvas. I last saw her at a talk she gave with Ben Rivers at the Tate in the autumn about their films and paintings; it was an electric evening that swept me straight back into the studio. Seeing shows online and reading catalogues makes one hungry too, of course. Artists have always been comforted by images of their peers’ studios. And Instagram has replaced, for me, the early morning stroll around the college works-in-progress. Now we can root for our friends and colleagues, who are generous enough to open up their practices on Instagram. I have been rooting for the fantastically impossible sculpture that Hugo Wilson has been making over the last couple of months. And have discovered a predilection for the artists shown by Peter Ibsen in his beautifully documented exhibitions and travels with his Sunday Gallery in Copenhagen. My studio is a couple of minutes walk from my house, so after breakfast with the family and getting the children off to school, I play a Ramones song for the short commute. When I arrive, I look at the work I have made the day before and put on a less frenetic album on repeat. The music acts as a kind of buffer to the world. I draw or paint until the neuralgia in my hands acts up and then I begin to model the three-dimensional elements of my practice, mostly in my left hand. I have a small north facing studio, in an old film studio in Islington that has been partitioned up. Here the maquettes and paintings are made on a small table. I make many paintings and maquettes and edit a lot back. I spend a lot of time looking and turning the paintings and models around in my hand before having them scanned or photographed for fabrication. The large sculptures where initially made in the vehicle design department at the RCA on a 5-axis CNC mill and were finished like cars. The sculptures are now milled by a Kuka Robot in a factory that supplies parts to the aeronautical industry. The photographs because of their scale are also printed, mounted and framed off site. And of late I have found myself doing shows where I only see the finished work just before their installation, due to the small size of my studio. With the book works, titles are taken from the title of the book or a text within the work. The sculptures are also named after book titles or lines of text because the maquettes are often used in assemblages with books before they are chosen to be enlarged. Or sometimes the titles are the result of some meaningful accident as with ‘Glanz’. I have just begun tests in digital embroidery . . . Simple drawings in chalk and crayon become something quite other after they have been photographed, enlarged and stitched. I would love to make some sort of collaboration in fashion. It is such a privilege to work with people with such a wealth of knowledge in their field. A clip from the Summa Theolologica Film, in an edition of ten. Contact me for availability. Excited to be organising a three person show with artists Henry Hussey and J Price curated by Julie Bentley, with After Projects for Frieze Week, in the Asylum Chapel, Peckham. 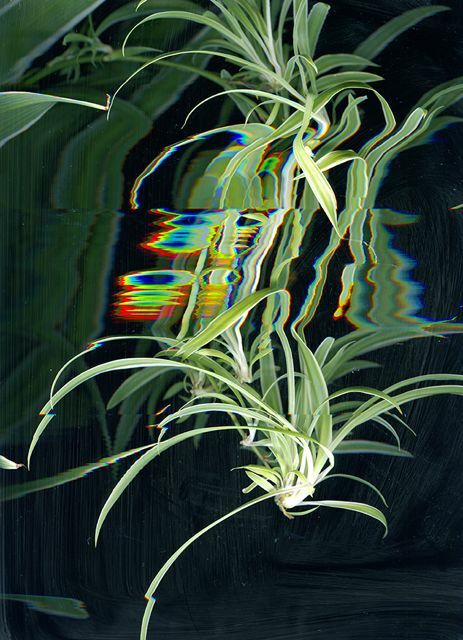 The work of Augustine Carr crosses several registers, combining painting, sculpture, print, photography, digital scanning and film. An appropriated book cover is painted over, not so much defaced as embellished, and then it is scanned and printed at a much-enlarged scale. His work ‘Things to Make’ depicts a few trees painted in a free and simple manner. The book it is painted on, referred to in the title, is the classic book for children, and it underlines the childish nature of the painting. But there is more than just childish irreverence at play however, as the enlargement works to both distance us from the emotive painted book and to bring us closer to it through its enlargement. The device is both undone and magnified, as is the emotional intimacy. His sculpture ‘Summa Theologica’ works in a similar way, but involves a small hand-modeled plasticine sculpture enlarged and reproduced by detailed CNC milling. Again, what appears as a small child-like sketch is enlarged and reproduced with a technical precision that it amplifies the haptic quality of the object and places it in a space of intimate virtuality. Augustine Carr also makes films, involving his sculpture and shifts of scale. His ‘An Investment for Economy’ involves a hearse driving an enlarged life-size reproduction of a set of hand-modeled castle crenellations. The object and the performed action are doubly over-blown and yet with the distance of the film medium, the elegy to what might be an embattled childhood is given poignancy. Production still from "An Investment for Economy"